You can integrate your HubSpot website and blog content with Google Analytics by adding your Google Analytics tracking ID in your HubSpot settings. If you have a customized Google Analytics account, or if you only want to add Google Analytics tracking to a specific page or blog, add your Google Analytics tracking code snippet to the site header HTML for your pages or blog. Click the Choose a domain to edit dropdown menu and select the domain to add the code to. To add the code to all your HubSpot-hosted domains, select All domains. Click the Integrations tab, then select the Integrate with Google Analytics checkbox. In the text field, enter your Google Analytics tracking ID. Click the Choose a domain to edit dropdown menu and select the domain to add the code. To add the code to all your HubSpot-hosted domains, select All domains. In the Templates tab, Site header HTML section, enter your Google Analytics tracking code snippet. Please note: if you add code to the header or footer HTML for a specific domain, it will override any code you've placed in your header and footer HTML for All domains. If you've applied your code to all domains using the instructions above, your code will be applied to all your HubSpot blogs automatically. Only follow these instructions if you want your code to be applied to a specific blog and not your other HubSpot content. Click the Select a blog to modify dropdown menu and select the blog you want to track with Google Analytics. Click the Templates tab, and in the Header HTML for Blog Listing Pages field, enter your Google Analytics tracking code snippet. 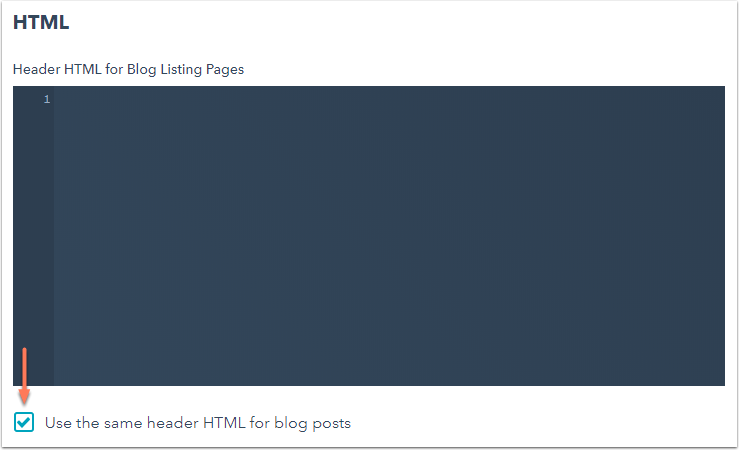 To apply the code to your blog posts as well, select the Use the same header HTML for blog posts checkbox. Hover over the page you want to update and click Edit. Click Advanced Options and scroll down to the Advanced Code Snippets section. Enter your Google Analytics tracking code snippet in the Head HTML code editor.